One push of a keyboard button transports you into a world of fire-spitting dragons, warrior heroes, exotic market places and undreamt of treasure! 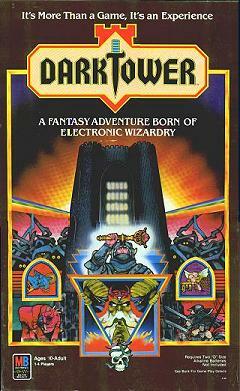 Dark Tower is an electronic fantasy adventure game first published by MB in 1981. Dark Tower is a very rare game to find, as it was the subject of an intellectual property lawsuit and was removed from sale shortly after release. It is also especially hard to find copies in full working order, as the tower electronics were prone to breaking down after extended use. A fully complete and working copy of Dark Tower therefore sells for very high prices. Price: From £350 plus postage.